Summary: The JLL IC200 looks amazing compared to other exercise bikes. 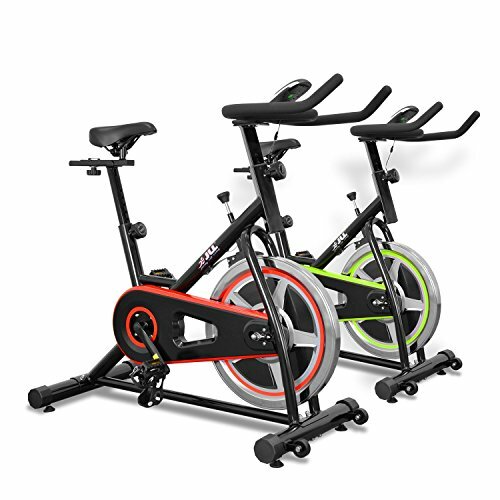 JLL already had a similar looking mid-range model (the IC300), and has introduced this lower priced home exercise bike into the range to cover the budget market. The main differences between the 200 and 300 are a smaller flywheel and a more basic (though still pretty good) computer. This model has some very good feedback, and a solid amazon discount too – see the product page for more. Promotion price for new listing with limited time. 10kg flywheel which allows a smooth ride for beginners or a challenging and tough workout for serious athletes. Seat can be moved both vertically and horizontally so you can find your perfect riding position. This exercise bike has 2 elements which are designed to closely mimic real cycling. The first is a 3 piece crank system, and the second a chain – which leads to the 10kg flywheel. This gives you comfortable peddling, and also ensures that the resistance stays smooth and reliable. For comparison, the JLL IC300 has an 18kg flywheel (though to be fair, most regular users will not notice much difference at the lower to mid resistance levels). The seat is adjustable both vertically and horizontally, and commenters note that this is comfortable for a range of heights and weights. The maximum user weight is recommended to be under 100kg. While more basic than the equivalent on mid to higher priced models, the LCD computer display should cover most of your needs. You can track distance, speed, calories burned and time – though there is no pulse tracker on this model. If you want this a simple heart-rate monitor will cost you less than £10 in many cases, see this listing page at amazon for more. What really makes the JLL IC200 stand out for me is the looks. It seems like they binned the old concepts of what an exercise bike should look like altogether – and created something brand new. The result looks sleek and stylish, with a black frame contrasting with coloured wheels and chain guard. More than 95% of the comments (at the time of writing at least) are 5 or 4 stars, which is excellent in this category. Terms like ‘rock solid’, ‘sturdy’ and ‘robust’ give the impression that you are not getting a flimsy piece of equipment with this bike! You will need to put the bike together after unpacking, which caused a couple of comments – though most people found it easy enough. One commenter did note the basic computer, and another found some ‘bubbling’ in the paint behind the fly-wheel. Based on looks, solid build and the huge discount (usual disclaimer: ‘at the time of writing’) at amazon, it is easy to see how the JLL IC200 exercise bike made the best sellers list. If you are looking for a great bike and are on a budget, then this one would be a strong recommendation. Check out the amazon product page now to see the full spec and user feedback.